Didier Drogba, who is regarded by many to be one of Africa's greatest goalscorers ever, has explained why he thinks Real Madrid and Portugal superstar Cristiano Ronaldo is the best striker in the world. The 33-year-old, who has found the back of the net four times in two games at the 2018 FIFA World Cup, saw his goal against Morocco put him ahead of Ferenc Puskas as the all-time European record scorer with 85 goals. Chelsea legend Drogba, who scored 65 goals in 105 appearances for the Ivory Coast, believes Ronaldo is a complete forward and is leaps and bounds ahead of his competition. "He is the best striker at the moment in the world," he told the BBC. "He is complete, he can score headers, he can score left foot, right foot, free-kicks, and he is always in movement. "I think, for a defender, it is very difficult to defend against a player who is always moving and it is easier for a midfield player to find a guy who is always in movement." Ronaldo scored 44 goals in all competitions last season, with 26 of those coming in La Liga despite somewhat slow start. 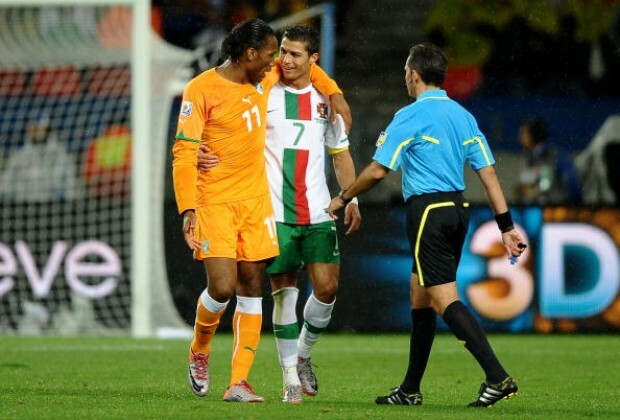 Do you agree with Drogba's opinion about Ronaldo? Have your say in the comments section below.